← Cuba’s Ambassador to the United States: Who Is José Ramón Cabañas Rodríguez? U.S. citizens are rediscovering the Caribbean country that has been off-limits for more than 50 years. Known as the Pearl of the Antilles, Cuba is regaining its luster as it prepares for an onslaught of U.S. visitors who are eager to experience the island’s unique culture. In Havana, the streets are filled with the rat-tat-tat of jackhammers and beeps from construction vehicles as historic plazas and centuries-old Spanish Colonial buildings are restored to their former glory. While Americans still cannot travel on tourist visas (as of press time), they are signing up in record numbers for people-to-people educational exchanges, one of the 12 approved categories for visits to Cuba. In 2014—before the U.S. and Cuban governments began restoring diplomatic relations—more than 700,000 U.S. citizens visited, according to the International Monetary Fund. The numbers were expected to be much higher by the end of 2015, and the IMF estimates as many as 10 million American tourists per year will eventually travel to the island. Ask anyone why they want to go now, and they’ll say they want to see Cuba before the country becomes too touristy. Although it’s is only 90 miles from Key West, chances are Cuba won’t be “Americanized” anytime soon. Just in case, though, here are some things you should see and do for an authentic experience. The moment you walk outside of Havana’s José Martí Airport, you’ll notice the glint of chrome from classic American cars used as taxis. More than 60,000 pre-1961 American cars are estimated to be running on Cuban roads. The island’s mechanics are quite ingenious when it comes to keeping the cars in pristine condition, because the U.S. embargo has made getting parts quite difficult. A two-hour guided tour through Havana in a Cuban vintage taxi costs $50 per person. It’s a great way to hear stories from the driver about the city and his car. And it’s the first step to feeling like a Habanero. When you return from Cuba, one of the first things friends may ask is if you bought any Cuban cigars. Currently, Americans can bring home only $100 worth of cigars, which adds up quickly if you want the famous Cohibas or Montecristos (favorites of Winston Churchill and John F. Kennedy). Even if you are a non-smoker, it’s fascinating to watch the cigar rollers at the Fábrica de Tabacos H. Upmann, one of four factories open for guided tours. Established in 1844, Upmann’s produces about 20,000 hand-rolled cigars a day, most of which are exported through a British company. The government-owned factory does not allow photography equipment or large bags. If you want photos rather than cigars, head to the picturesque Viñales Valley, the tobacco-growing region west of Havana. Several tobacco farms are open for tourists, such as the one owned by Benito Camejo, a fifth-generation tobacco farmer. Just three miles north of Viñales is the Cuevas del Indio, a large grotto with an underground river. Tour boats pick up passengers every 15 minutes from an underground pier and then wind their way through a maze of limestone tunnels. Paladares—that’s the word to remember if you want authentic Cuban food and you want to support blossoming private enterprise. These family owned restaurants, often located on the ground floor of a home in a residential neighborhood, offer delicious meals at reasonable prices. Paladares began in the late 1990s and were named after a restaurant chain in the Brazilian soap opera “Vale Tudo,” which was airing in Cuba about the time licenses for private eateries were issued. Wherever you dine, expect black beans and rice—a staple of Cuban cuisine—and lots of conversation with the owners, who are usually thrilled to be serving Americans. Traveling to Cuba on a people-to-people license requires educational-related endeavors, and one approved activity is learning to cook with Cuban chefs. The ArteChef Project in the Vedado neighborhood of Havana is both a culinary school and restaurant. Created in 2007 to update chefs on new and international cuisines, ArteChef is partially subsidized by the Cuban government. Chefs from around the world have taught and trained in the combined kitchen/classroom, where the weekly Cuban television show “El Arte del Chef” is taped. Visitors begin the evening learning to mix a mojito, Cuba’s official welcome drink, which they can enjoy during a hands-on cooking demonstration and dinner. ArteChef is also a restaurant with an extensive menu where guests can savor the cuisine without stopping in the kitchen first. The chefs-in-training often visit the dining room and explain how they prepared the dishes being served. When Christopher Columbus introduced sugar cane to Cuba in 1493, the country’s destiny to become the rum capital of the world was set. Visiting the Havana Club Rum Museum provides an interesting journey through rum’s history with dioramas, displays and, of course, tastings. The guides are knowledgeable, humorous and eager for guests to understand the importance of rum to Cuban culture. You’ll learn that Cubans have continued the tradition of always spilling a “drop for the saints” when they open a new bottle and what they consider the best vintage for a Cuban mojito. Havana is a melting pot for all types of art and architecture, especially around the historic plazas, many of which UNESCO is helping to restore. The Plaza Vieja (Old Square) is a prime example of Havana’s transition toward becoming a tourism destination. Once in complete disrepair, the plaza is in the final stages of restoration with restaurants, boutiques, a photography museum, and even a planetarium. Havana has several world-renowned museums, including the Museo Nacional de Bellas Artes (National Museum of Fine Arts), and the Museo Napoleonico, a repository for more than 7,000 items once belonging to Napoleon Bonaparte. In addition, Ernest Hemingway’s former home, Finca Vigía (“lookout house”), is now a museum honoring the legendary novelist who lived in Cuba from 1940 to 1960. Hemingway’s 9,000-book collection and original furnishings are on display as is his sport-fishing boat, the Pilar. Located on a hillside about 10 miles east of central Havana, Hemingway’s writing garret, or tower, offers a spectacular view of the city’s skyline. It’s on the street, however, where the most vibrant artistic displays take place. The Afro-Cuban rhythms at the Callejón de Hamel art project will draw you into Salvador’s Alley in Old Havana for a colorful performance about the ancestral Santería spirits that many Cubans still worship. Street performers and mimes gather in the plazas, working for tips. Galleries are pushing aside Russian-inspired art pieces in favor of works showing American flags and, of course, the ubiquitous vintage cars that Americans crave. To understand why music and art are such an integral part of everyday life, visit the Instituto Superior de Arte, Cuba’s leading art academy built on the grounds of the former Havana Country Club. Young artists, musicians and dancers are happy to talk about their work and what the future holds for them. –U.S. 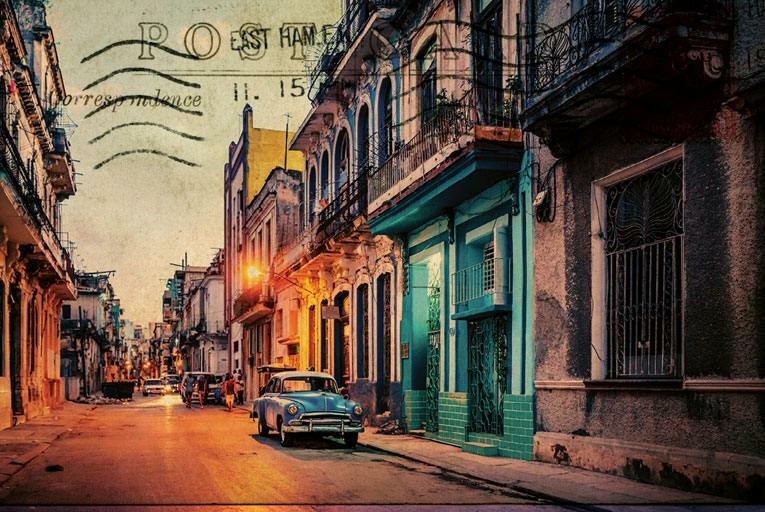 citizens traveling to Cuba need a valid passport, a Cuban visa referred to as a “tourist card,” and a license from the U.S. Department of Treasury’s Office of Foreign Assets (OFAC), which offers 12 categories of authorized travel to Cuba. As of press time, general tourism was not one of those categories. Most U.S. travelers visit through a people-to-people educational exchange license, which requires a planned itinerary and direct personal contact with the Cuban people. –Do not be tempted to visit Cuba through a third country, such as Mexico or Canada. U.S. citizens who fail to comply with Department of the Treasury regulations may face civil penalties and criminal prosecution upon returning to the U.S.
–Access to some Cuban sites is by appointment and requires a local guide; in addition, hotel rooms are scarce and are sometimes available only to licensed groups. Therefore, it is easier to plan your trip through an OFAC-licensed agency, which can help you secure the appropriate documents and plan a customized itinerary of interest. –In mid-December 2015, U.S. and Cuban officials reached an agreement to allow commercial flights to the island beginning some time this year. Meanwhile, most flights are charters including the ones currently leaving from Orlando International Airport.